Will there or will there not be a skate protest down Newport Ave on Sat, Dec. 13? 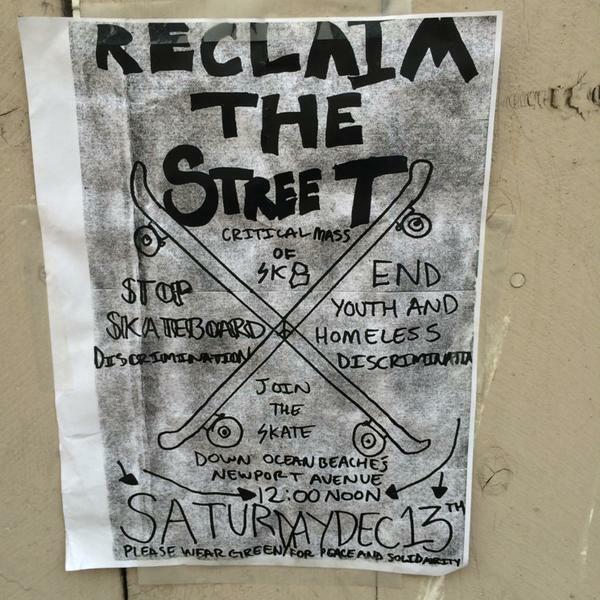 There’s fliers out here and there around OB of late that call for a “skate protest” on Saturday, Dec. 13. We’ve seen two variations – one calls for “Reclaim the Street”, and “Stop Skateboard Discrimination” and “End youth and homeless discrimination”. The other says: “Support OB Culture”, and calls for “youth and homeless discrimination awareness”. Both call for a Skate down Ocean Beach’s Newport Avenue at 12 noon on Saturday. One asked “Please wear green for peace and solidarity”. Both fliers had been apparently printed off a xerox, and were gray with hand-written text and symbols. But when our roving OB Rag reporter asked at various skate and surf shops in and around Newport Ave., OB’s main commercial street, no one knew anything about it. Only one person had at least seen a flier about the event. In the meantime, will there or will there not be a skate protest down Newport Ave on Saturday. Only the skate gods know for sure. uhhhh nobody is discriminating homeless people or skateboarders unless they’re breaking the law. Leaving garbage all over newport, drinking in public, using drugs in public, and panhandling are illegal, being asked to stop isn’t discrimination. OB culture isn’t to trash the place. It bewilders me…. but if you live on the streets, why not take care of the streets instead of leaving trash everywhere? “Leaving garbage all over Newport, drinking in public…” I only want to add to your list that *STEALING* property from hardworking resident’s cars and yards, isn’t exactly “part of the OB culture,” either. Can’t agree with you more, look at yelp reviews for local restaurants, great food ! great service, but the people laying around the parking lots and sidewalks in FRONT of the business’ get more attention than the FOOD ! we don’t have a skateboard or homeless problem we have a police enforcement problem. Cpt Ramos, Lt Weeden , Officer Efren Santiago all provide sanctuary for those individuals that really cause problems in Ocean Beach . Police continue to be under the control of their landlord. They have Officer Efren’s Camp at dog beach, Weeden Ridge has plenty of bushes to hide in, Ramos Pits burn all night, unfortunately some of their guest have skateboards and don’t act responsible this reflects on the 99% that don’t cause problems. These three need to clean up after their guests.